The first Lancer Evolution used the 2.0 L turbocharged DOHC engine and AWD drivetrain from the original Galant VR-4 in a Lancer chassis, and was sold in GSR and RS models. This engine was also used in theMitsubishi RVR with the Hyper Sports Gear trim package, and the Mitsubishi Chariot Resort Runner GT. The RS was a stripped-down version that lacked (power) windows and seats, anti-lock brakes, a rear wiper, and had steel wheels to weigh approximately 70 kg (154 lb) less than the 1,238 kg (2,729 lb) GSR, ready for racing or tuning. The RS version was released with a mechanical plate type rear Limited-slip differential (LSD). The GSR came with all of the conveniences of a typical street car, including a digital screen climate control system. It came with Mitsubishi's 4G63 engine producing 247 PS (182 kW; 244 hp) at 6000 rpm and 309 N·m (228 lb·ft) at 3000 rpm. 5,000 of the first generation Evolutions were sold between 1992 and 1993. Top speed was 228 km/h (142 mph). The GSR version of the Evolution I was the only Evolution Lancer released with a Viscous Limited Slip Rear Differential (VLSD). The subsequent Evolution Lancer models all featured rear mechanical plate type LSD's. February 1995 saw the arrival of the Evolution 3, followed a pre-release in 1993 which had several improvements over the previous models. New, more aggressive styling and a new nose moulding improved the air supply to the radiator, intercooler and brakes. New side skirts and rear bumper moldings and a larger rear spoiler were added to reduce lift. Improved engine had higher compression ratio than before, and new turbocharger compressor (65 mm to 68 mm), which gave power output of 270 bhp (201 kW) at 6250 rpm, 309 N⋅m (228 lb⋅ft) at 3000 rpm. The Lancer platform was completely changed in 1996, and along with it, the Evolution, which had become extremely popular throughout the world. The engine and transaxle were rotated 180° to better balance the weight and eliminate torque steer. There were two versions available, The RS and GSR. The RS version was produced as a competition car with a limited-slip front differential and a friction type LSD at the rear. It also came with GLX seats and a choice of either 16" or 17" OZ light weight racing wheels. The RS also had wind up windows, optional air conditioning in some models, and a few extra brace bars to strengthen the chassis, one behind the front grill and the other across the boot floor. The GSR and the RS shared a new twin scroll turbocharger which helped to improve response and increase power to 280 PS (206 kW; 276 hp) at 6,500 rpm and 330 N⋅m (243 lb⋅ft) torque at 4,000 rpm. Mitsubishi's new Active Yaw Control appeared as a factory option on the GSR model, which used steering, throttle input sensors and g sensors to computer-hydraulically control torque split individually to the rear wheels and as a result the 10000 Evolution IVs produced all sold quickly. The Evolution IV can be distinguished by its two large fog lights in the front bumper (option on RS version), and the newly designed tail lights on the rear, which became a standard design to Evolution V, which would become yet another trademark of the Evolution series. 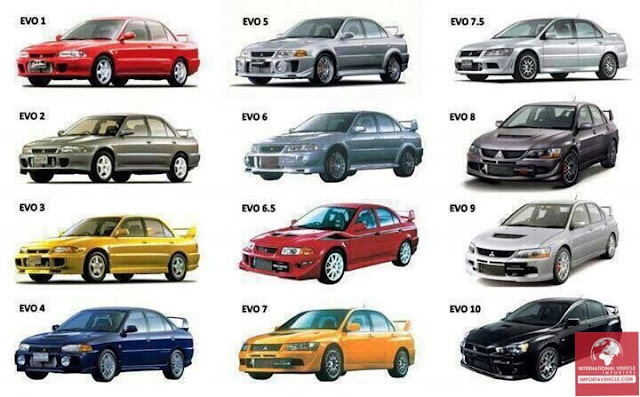 This new generation was slightly heavier than previous Evos—the GSR in particular due to the added technology systems—but to counter this the car produced even more power—the weight of the RS being 1,260 kg (2,778 lb) and the GSR being 1,345 kg (2,965 lb). Much of the technical improvements for this generation were also used in the second generation Mitsubishi RVR sold only in Japan. RS – "rally sport" Close-ratio 5-speed, minimal interior, rally suspension, 1.5 Way LSD, (Shortened close-ratio 5-speed transmission, Auto Air Conditioner, Enkei Wheels, Recarobucket seat, Brembo brakes, power windows are available as options). The track was widened by 10 mm (0.4 in), the wheel offset changed from ET45 to ET38 along with the wheel diameter which rose from 16" to 17" to accommodate Brembo brakes which were added to enhance braking. Furthermore, the turbocharger was again improved. Torque was increased to 373 N⋅m (275 lb⋅ft) at 3000 rpm. Power officially stayed the same, at 280 PS (206 kW; 276 hp), though some claim horsepower was actually somewhat higher. RS – "rally sport" Close-ratio 5-speed, minimal interior, rally suspension, 1.5 Way LSD, (Shortened close-ratio 5-speed transmission, Auto Air Conditioner, Enkei Wheels, Recarobucket seat, Brembo brakes, power window are available as option). The Evolution VI's changes mainly focused on cooling and engine durability. It received a larger intercooler, larger oil cooler, and new pistons, along with a titanium-aluminide turbine wheel for the RS model, which was a first in a production car. Output was rated at 280 PS (276 hp; 206 kW) @ 6500 rpm and maximum torque of 373 N⋅m (275 lb⋅ft) @ 3000 rpm . The Evolution VI received new bodywork yet again, with the most easily noticeable change being within the front bumper where the huge fog lights were reduced in size and moved to the corners for better airflow. A new model was added to the GSR and RS lineup; known as the RS2, it was an RS with a few of the GSR's options. Another limited-edition RS was known as the RS Sprint, an RS tuned by Ralliart in the UK to be lighter and more powerful with 330 hp (246 kW). Yet another special edition Evolution VI was released in December 1999: the Tommi Mäkinen Edition, named after Finnish rally driver Tommi Mäkinen who had won Mitsubishi four WRC drivers championships. It featured a different front bumper, Red/Black Recaro seats (with embossed T. Mäkinen logo), 17" Enkei white wheels, a leather Momo steering wheel and shift knob, a titanium turbine that spooled up more quickly, front upper strut brace, lowered ride height (with tarmac stages in mind), and a quicker steering ratio. Amongst other colours, the Evo VI came in either red (Tommi Mäkinen Edition only), white, blue, black or silver with optional special decals, replicating Tommi Mäkinen's rally car's colour scheme. This car is also sometimes referred to as an Evolution 6½, Evolution 6.5, or TME for short. The introduction of the Evolution VII also marked the first time an automatic drivetrain was included within the model lineup—the GT-A. Seen as the 'gentleman's express' version of the visually similar VII GSR and the RS2, the GT-A model was only produced in 2002 and had the following distinguishing interior and exterior specification: GT-A-only diamond cut finish 17-inch (430 mm) alloy wheels, clear rear light lenses and all-in-one style front headlights (later used on the Evolution VIII). The GT-A had the option of either no spoiler, the short spoiler (as per the Lancer Cedia; and later used on the Evolution VIII 260) or the thunderspoiler as used on the standard Evolution VII models. The most distinguishing feature was a smooth bonnet with no air-grills on it at all and the revised front bumper. Although offering inferior cooling capabilities, the bonnet was designed to give a cleaner line through the air with less air resistance at motorway speeds. This model of Evolution was used on the film 2 Fast 2 Furious as the car driven by the late Paul Walker. He drove a yellow Evolution 7 which was lightly modified performance wise but heavily modified when it comes to the aesthetics. However, one of the producers claimed that they used a 2001 Mitsubishi Lancer Ralliart edition instead of an Evo as the car used for production and stunt scenes. Based on the title, does this mean that all will be available to import as of October 2017 or just the Evo 1? Try reading past the title. Cars have to be over 25 years old to be legally imported.